Back in the earlier (read: lighter) days, I carried Baby Spawn in a linen ring sling or a stretchy wrap. The ring sling (rs) was very light and easily transportable in our diaper bag or backpack. It kept her close but didn’t make her too sweaty. Ring slings are exactly that. A long piece of fabric with two metal rings that you adjust to hold the baby. The anatomy of the sling consists of shoulder, top rail, bottom rail, rings, pouch and tail. They’re pretty amazing for newborns because you don’t need an insert or padding. But you do need to learn how to carry them correctly because there is a lot of room for error. The most popular fabrics used are linen, cotton and conversions from woven wraps! There are also nylon or polyester ring slings that are made to go into the water! Most ring slings tend to be priced between $35-100, depending on manufacturer and material. I ordered mine from Sleeping Baby Productions (SBP), and it is a simple linen RS. There are lots of manufacturers who make ring slings and they’re beautiful. Some use woven wraps and convert them. Some use silk. You could custom order one! Whatever you choose, do your research on its quality, check out reviews and find a local babywearing meetup to try them on to see if it’ll work for you and baby! As she got older, Spawn liked to be carried on my hip with the ring sling. She could look out and turn her head and still have a good seat on her. I’ve since lent out my ring sling to new mom friends and it’s been getting some great use! 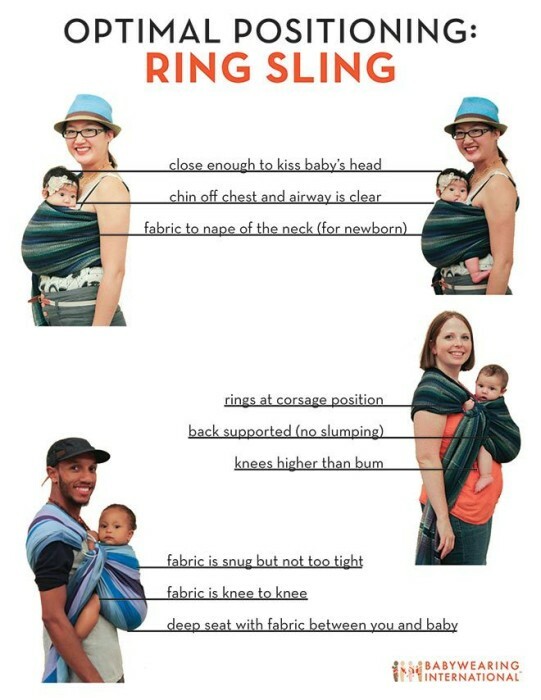 If you’re wondering how a ring sling might fit you and your baby, check out your local babywearing group and attend a meetup! Question – when they’re little, are their feet supposed to be in the sling or outside the sling? I used one with Luke and I thought it had to be in but i feel like it would be a better fit if it was outside? I think it depends on how little. From what I’ve learned, you keep their legs in an M-shape/froggy with legs IN. But by about Month 3, you can have legs out. 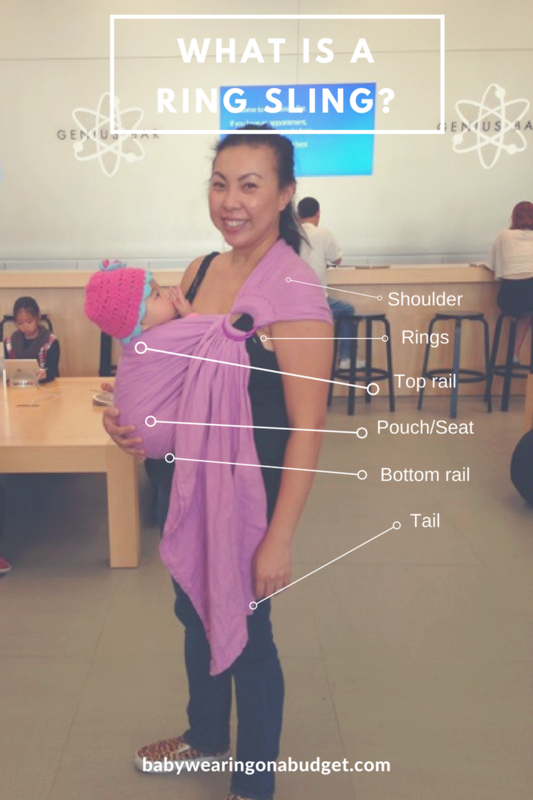 I would double check with a certified babywearing educator in your area, just to verify. Thank you! Great wisdom thanks! I was wondering have you ever heard of Vienna springs slings? Im trying to make a decision of ego to buy for my first day wear RS purchase. I currently own a water RS & I fell in love! My daughter is 1 and about 25lbs. Great wisdom thanks! I was wondering have you ever heard of Vienna springs slings? Im trying to make a decision of which brand and materialistic to buy for my first day wear RS purchase. I currently own a water RS & I fell in love! My daughter is 1 and about 25lbs. I haven’t heard of Vienna Springs, so I looked them up. They are a BCIA member and follows the CPSIA guidelines for carriers, which gives me peace of mind. Have you been able to check out the slings in person, to feel the materials and see if they’ll work for you? I know that cotton/bamboo blends tend to be nice and soft; same with WCRS (wrap conversion ring slings) – the more you wear them/break them in, the softer they get. (But they are also a little pricier from the get-go. So budget is going to be a factor in considering a WCRS.) Please let me know what you end up purchasing!! Thank you for visiting!